Tested Xbox 360 power brick. It has a LED indicator light to display the power status of the Xbox 360 E system. Compatible with Microsoft Xbox 360 E only for 4G and 250G version. Power cable plug: US/EU(optional). We promise we will do our best to serve you. D 2 ( 367. ) 2018-01-11. Length: Approx 11.41" / 29 cm. Quatity : 1. Color：Black. Item Discription. You may also like. Sports Accessories. Item is used, clean, in good working condition, has scratches, scuffs, nicks,normal wear, see pictures for detail. This unit is for old school Xbox. NO POWER CORD (SEE PHOTO). Model: Kinect. Platform: Microsoft Xbox 360. Item Type: Xbox 360. Type: Power Adapter. They maybe marked, or have identifying markings on it, or show other signs of previous use. Location: #Z153. Signs of wear can include aesthetic issues such as scratches, and discoloration. ④Support old 203W, 175W xbox 360, to make it can be used on the xbox one by this port. ⑤This is a premium quality AC Adapter Cable for the Xbox One. ⑦ Connects quickly and easily to your Xbox one. You may also like. Power Adapter 175W. If you do not have a port that matches it, it will not work! Microsoft XBox 360. 150 watts and LED Status light. If you do not have a port that matches it, it will not work for you. Power Cord. They work very hard to get quality products to you quickly. You will get the following. 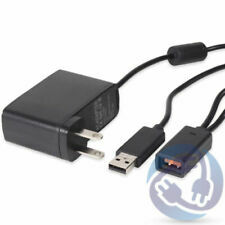 OEM Genuine Xbox 360 Power Supply Brick 150w Adapter Cable with power cord. Condition is Used. Some minor chew marks from cat but item is working as new. Shipped with USPS Priority Mail. OEM Genuine Xbox 360 Power Supply Brick 203W output with Cable. Condition is Used. Some chew marks from cat but item is working as new. Shipped with USPS Priority Mail. Location: #Z187 Or #P 150W Model. Platform: Microsoft Xbox 360. Item Type: Xbox 360. Model: Xbox 360 Pro. Type: Power Adapter. Cable Length: Not Applicable. Condition: Used: Very Good. They maybe marked, or have identifying markings on it, or show other signs of previous use. Microsoft Xbox 360 power cord, brick, and component HD AV cable. Condition is Used. 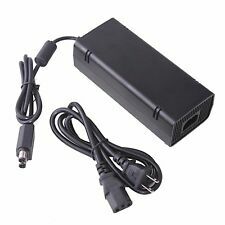 OFFICIAL MICROSOFT XBOX 360 POWER SUPPLY BRICK AC ADAPTER HP-AW205EF3 LF. Condition is Used. Shipped with USPS Priority Mail. What you see in the photos is what you’ll receive. Thank you for looking. Trending at $15.68eBay determines this price through a machine learned model of the product's sale prices within the last 90 days. OEM Genuine Xbox 360 Power Supply Brick Adapter Cable. Condition is Used. Shipped with USPS Priority Mail. AUTHENTIC AND IN GREAT WORKING ORDER. Sometimes purchasing new electronics can seem intimidating, especially with all of the different brands, styles, and types of electronics out there. Xbox 360 is part of Microsoft's extensive line of products, and the Xbox 360 is one of their gaming systems. 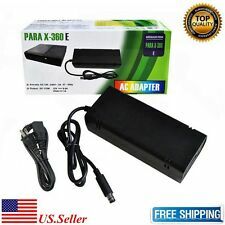 The following questions answer the most common concerns when it comes to purchasing the Xbox 360 power cord and video game power adapters from eBay. Can you purchase any power supply for the Xbox 360? 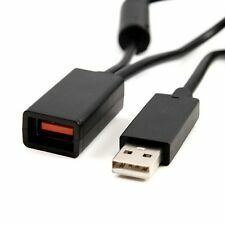 What type of Xbox 360 is this cord compatible with? What’s the difference between Xbox 360 and Kinect power cords? Xbox 360 Kinect: a device created to detect motion and let you communicate and use your Xbox 360 using your body as the controller. The Kinect requires a USB power cord in order to connect it to the Xbox 360. This also powers up your Kinect as well. Xbox 360: a gaming console that you may connect an Xbox 360 Kinect too. The power adapter for this is different and separate from the power adapter for the Kinect. You can find all of these parts on eBay.